Baby sign language and your child at daycare: is it worth trying? Baby sign language and your child at daycare: is it worth trying for a working parent? Baby sign language has become popular in the last few years. But it’s also raised some questions. We can’t deny it’s very cute to watch a baby communicate before they can speak. But when it comes to baby sign language and your child in daycare, is it worth trying? Doesn’t baby sign language take consistent effort? Will your baby really learn how to sign while in childcare? Let’s delve into this subject a bit more, starting with some basic understandings of baby sign language. The first thing to know is that baby sign is not an official sign language. It doesn’t include grammar, for instance, found in the languages that the deaf would use to communicate. And, the gestures themselves, even though they are basic, are not always the same as what a non-hearing child would learn. So the sign language adopted by parents and daycares to teach babies communication before they can speak is modified. It’s meant to be easier, and based on simple one-word gestures with general meaning. One of the popular baby signs is “more.” But what does “more” mean, really? More food? More toys? More tickles? It’s not as concrete as say, “drink.” And yes, there are both the more concrete types of baby sign words, and the ones based on concepts. Some say that the concept-based words can become problematic for communication later, since their meaning is not as well-defined, and they can be used in many contexts, which is not helpful. Despite baby sign not being an official sign language, there are some materials published on it for parents who want to follow a system to teach it to their baby. A daycare provider may already be using one of these existing methods or ‘sets’ of gestures. Or, they may have their own. Whether or not you decide to take up baby sign language is totally up to you. It doesn’t mean you are not giving your child enough attention if you don’t. And it doesn’t necessarily mean you are improving or delaying development in your child if you do. The same is true of any daycare that chooses to use it, or not use it. Many studies have shown it’s both not harmful, and not necessarily an advancement to oral speech development (see the many links in this article for more on this). It appears that not enough research has been done to come to any conclusion about the pros and cons of baby sign. The important takeaway from some studies however, is that parents and babies gesture all the time. It doesn’t have to be ‘official’ signing. You probably have already seen your 8-12 month old baby shake their head back and forth to indicate “no.” And you’ve probably witnessed pointing at things too. Between you and your child, it’s likely you have your own clues as to what they are saying, in their own way. Child care providers can notice this too, and pick up on it. So that is all to say that baby sign is not the only form of communication with your child, and it can’t be said to be a superior form of it either. But it has been testified to help start communication earlier than relying on vocal language alone, or crying! In fact, one mother has expressed deep regret at beginning baby sign altogether, though she tried for months to teach it to her son. In her view, it made communication harder, not easier. Her son had delayed speech development too, which had potential for more frustration. Though, in doing more reading on the subject, we can’t say that is an issue that derives specifically from baby sign. It seems to have only been a case-in-point for her own child – who’s to say that no baby sign teaching would have had the same outcome? As these experts say, signing doesn’t delay language development, and it’s a falsehood to expect toddlers to talk early. Baby sign and daycare: how does a working parent manage both together? This is a great question. While your baby is in childcare, you may want to keep up with home efforts at learning to speak. And you also don’t want to come home not understanding what your child is saying – regardless of the question about whether or not to teach baby sign. Daycares can have programs where baby sign is part of their curriculum, or even just a part of the activities of the day. There are noted benefits to using this type of language at daycare, noted here. To do this, early childhood educators may be using a specified chart or system for teaching baby sign, which you can ask about. 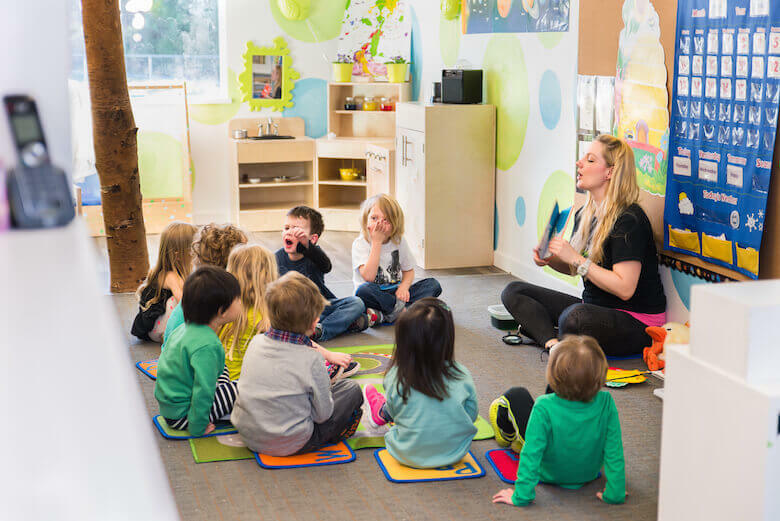 If you are well aware of what your baby or toddler is learning at daycare, you can spend the time to get to know it at home too, so you can further the communication queues with your child. The other thing is that if you have already started with baby sign at home, you can also ask your child care provider or early childhood educator to continue with what you’ve started. It’s probably not unlikely that you’re using gestures that other babies can pick up on too, or that can be taught to the whole group daycare. So in short, yes, to a degree, you can use baby sign at daycare, and still manage to keep it up at home as a working parent. All it takes is coordinating with a willing child care provider, or continuing on with their efforts at home. The key will be consistency of gestures, so the baby doesn’t get frustrated or confused. Whether it’s your own ‘secret’ language between you and your child (and your daycare provider! ), or an official set of baby sign, the main point is that there is no right and wrong when it comes to teaching a child how to communicate in their early life. Do what you’re comfortable with. If you’re concerned about conflicting efforts being done at daycare versus at home, this may be a simple solution to solve. All it takes is a bit of coordination and communication between the adults in this equation! After all, the baby sign gestures are not that hard to learn, since they’re not a full blown language. So they can be adaptable as-you-go, and with everyone involved in the child’s life. Some flexibility will be required on both the part of parents, caregivers, and the parents of other children in the group. So this can be a great way to come together as a community to teach babies to sign at daycare.